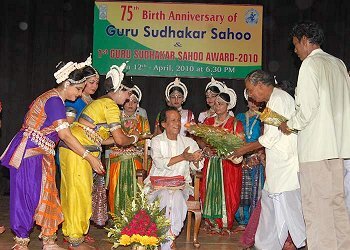 Congratulations are due to Kalabikash Kendra, Chhatrapur for having successfully organized the 75th birthday celebrations of Odissi Guru Sudhakar Sahoo (on 12th April 2010 at Rabindra Mandap, Bhubaneswar). Chhatrapur is a small town near Berhampur city in the southern district of Ganjam in Orissa. It must have taken a stupendous effort on the part of the 30 year old institution to have staged such a show in distant and difficult Bhubaneswar. Difficult, especially because there are a number of Odissi festivals happening in the capital city of Orissa and the corporate/Govt., patronage is getting rather thinly distributed. Hence a truly commendable effort by the Kalabikash Kendra, Chhatrapur which, since 1980, has been conducting classes from Primary to Master's degree level in Odissi dance, Hindustani vocal, Odissi vocal, tabla, violin, and the Fine Arts (painting). A few words about Guru Sudhakar Sahoo, the unsung but committed teacher and performer, will be in order. The seniormost disciple of Guru Debaprasad Das, Sudhakar babu also learnt music from Sangeet Sudhakar Balakrushna Das. 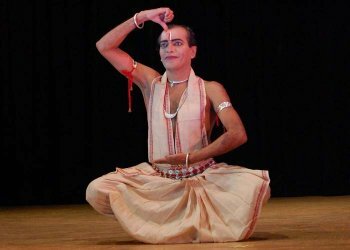 Thus he combined in himself the multiple proficiencies of dance teaching, Mardala playing and Odissi singing; on occasion he had sung for Odissi performances by the famed danseuse Indrani Rehman and also provided Mardala accompaniment for her. 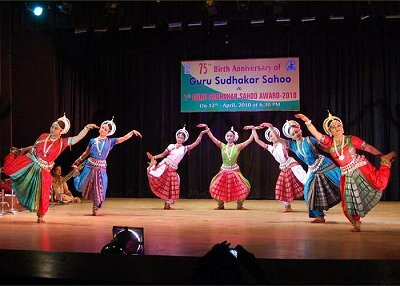 Guru Sudhakar Sahoo's special contribution lies in the fact that he has travelled the length and breadth of Orissa while teaching in a number of far-flung institutions which taught Odissi. In this, he has rendered yeoman service in the proliferation of Odissi dance among the young students of yesteryears. That he continues to do so is ample proof of this septuagenarian's vitality and commitment to the love of his life - Odissi. The invitation for this function on the 12th April gave the time as 6.30pm, but it was 8pm by the time the proceedings got under way. The usual delay in starting music and dance functions in Bhubaneswar has become a way of life. But in this case, the torment for the audience was further aggravated by a number of long-winded speeches, some of them even waxing eloquently on subjects quite unrelated to the event! The usual corollary of such delays and speechifying is that the actual performances get pushed late into the night: in this case, the reviewer was one of the few people present when the host organization was presenting its own item, (closing item of the festival) a group dance - the lateness of the hour and the departure of the audience became a sad and telling comment on the consequences of a habitual lack of punctuality. In a significant statement, the Minister of Culture said that he had been receiving grouses about the lack of importance given to the Guru Debaprasad Das's style and emphasized that this was not true at all. He and his department made concerted efforts in giving due and equal respect and acknowledgement to all those who have made signal contributions to the culture of Orissa. I, among others, am reassured by the Minister's statement since in the last few years, the Culture and Tourism departments have been enthusiastically supportive of major dance and music festivals in the State, and it can only be good for the performing arts if such encouragement and practical help continues under the leadership of the present dispensation. 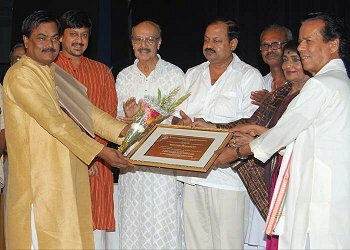 Apart from the Culture Minister Debiprasad Mishra, also present on stage were the eminent dancer Dr. Minati Mishra, the President of Orissa Sanget Natak Academy and well known singer M Sikandar Alam, Guru Sudhakar Sahoo, Member of Parliament and popular screen idol Sidhanta Mahapatra, MLA (Chhatrapur) Adikanda Sethi, among others. 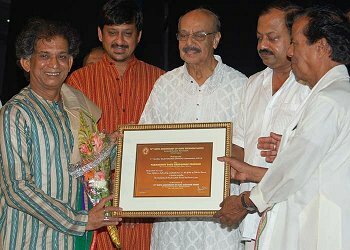 The Minister's speech was followed by the Award ceremony in which the newly instituted 'Guru Sudhakar Sahoo Samman' was bestowed upon Guru Gangadhar Pradhan (Odissi dance), Guru Ramahari Das (Odissi music) and Guru Banamali Moharana (Mardala). 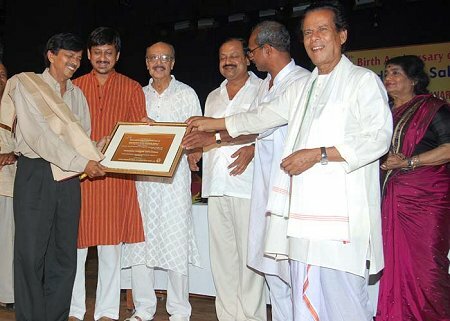 Guru Sudhakar Sahoo was felicitated by the Minister of Culture and the Guru's disciples, following which a tribute and biographical details were presented by dancer Nita Bohidar. M Sikandar Alam used the opportunity to regale the audience with an Odissi song and the all-time favourite "Sagare adhira neela taranga"; this provided welcome relief from the malfunctioning air-conditioning system! There was also a photo gallery highlighting important events in Guru Sudhakar Sahoo's life. In one of the photographs, a careless mistake has crept into the captioning. 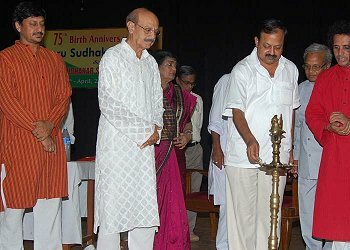 The picture showing Guru Sudhakar Sahoo with the dance scholar Late Dhirendra Nath Patnaik bears the erroneous caption 'Guruji with Hon'ble Minister SJ Murari Prasad Mishra & all artist (sic) of Sriya Chandaluni Dance Drama, at Sambalpur Kalaparishada.' Since there are regular visitors from outside the State, students and visitors from local institutions and the Art-inspired local audience, such carelessness reflects on the inefficiency of the host organization and lack of attention to the finer details and minutiae that contribute to the aesthetic success of a festival. Over time, small mistakes which are entirely avoidable if there is a little care, have a habit of repeating themselves! The cultural programme consisted of 7 dance performances, the opening item being a Mangalacharan/Guru Vandana presented by Dipti Mishra based on choreography by Guru Sudhakar Sahoo and with music by Dhiraj Mahapatra. Dipti is a senior disciple of Sudhakar babu. Overall, a satisfactory performance with a noticeable emphasis on the expressional aspect of dance. At times, however, the over-emphasis on the 'emoting' seemed to overwhelm the dancer. The saving grace was the evident enjoyment and involvement of the dancer in her work. Notwithstanding the correctness of her approach, there was a major flaw at the end. While taking leave of the audience at the conclusion of her performance, she stood poised on one leg and unhappily could not maintain proper balance. There was a perceptible shaking of the body and the light technician made matters worse by illuminating the dancer in a blaze of light instead of quickly defusing. The music, at this point, offered no help by refusing to fade out quickly. Thus the dancer was stranded in tremulous discomfort. The second item titled 'Panchabhuta' was danced by Vani Madhav and turned out to be a good performance. The composition features the five primary elements of the universal human experience, namely fire, water, earth, sky and air and the dancer having had good preparation, strove to bring out the essence of this very workable theme. A surprising and curious aspect was the repeated use of 'Alapadma'; this was used in a number of places where it was difficult to relate it to the sung text. The dancer needs to take note of three facets in the overall performance which tended to pull it down a bit - 1) on entry to the stage, a rather muddled playing by the Mardala player whose inner finger work was far from distinct, pushed the dancer to unsynchronized steps. No fault of the dancer and no fault of the Rabindra Mandap feedback system which has been refurbished at substantial cost! A careful Mardalika would always strive to support the dancer's movements and must have an acute sense of the dancer's needs. 2) In transiting from one movement to the next, the dancer showed an undue abruptness which tended to take away from an otherwise graceful effort on her part. 3) The other noticeable thing was in the execution of the 1-2-3, 1-2-3, stepping mode in the 'Chauka' position. Since the feet were placed rather widely apart, the dancer could not maintain the central body line with integrity because the weight bearing limb on count 2 could not help her to sustain the balance and resulted in a small shake every time. The choreography was by her Guru Sudhakar Sahoo and the music by Guru Ramahari Das was appreciable. 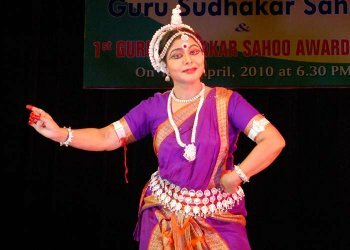 The third item was the familiar 'Kalyan Pallavi' and was performed by Dr. Manoj Kumar Behera who has actually acquired a doctorate in dance. His performance showed a diffidence which is obvious in someone who is not a very regular performer and hence has less scope for sustained and rigorous practice. The dancer's form showed an excessive elasticity (as different from flexibility) which betrayed a lack of firmness in the body line, especially in the 'Chauka', 'Tribhangi', a very loose-limbed 'Akasha Mandala' and a similarly inadequate 'Tarangaa' (in which the left palm is poised over the head and the right arm bent at a right angle to the shoulder) and its counterpose on the left side. To an extent, however, the dancer's deep involvement in this pure dance item and his obvious enjoyment did manage to redeem the performance. The choreography was by his Guru Sudhakar Sahoo. 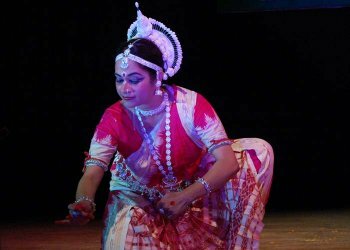 Item number four titled 'Ashtashambhu' was performed by Alaka Sahoo who was billed in the publicity brochure of the host institute as its "principal Odissi dancer, director and teacher." Like the previous performer, she too displayed an energy and enjoyment that can only spell a deep and abiding love for Odissi. But her performance also showed why it is necessary, often, to curb one's need for excessive stylising. On entry, she almost meandered onto the stage, the exaggeratedly curvaceous gait not really warranted, especially while dealing with the subject of the omnipotent and awesomely divine Lord Shiva! There were also a couple of places where the enactment of an episode (for e.g., Lord Shiva lifting the body of mortal remains of Sati in the Daksha Jagnya sequence) fell short of the heightened emotion required of it; the dancer's movement showed an abruptness and haste that she could have done without. This is not to take away from the overall pleasing effect of a mature and enthusiastic performance: for me it was yet another instance where one marvels at the good feeling which is generated by a dancer's enthusiasm, vitality and love for her art. The original choreograph by Guru Debaprasad Das was rearranged by Guru Sudhakar Sahoo with the music by Guru Ramahari Das. The fifth item of the evening was an abhinaya based on a familiar and much loved Odissi song (Uthilu ede begi kahinki re dhana) and was performed by Urmila Sahoo. This song by the legendary Oriya poet Gopalakrushna is redolent with the tender love shown to Lord Krishna by his mother, thus offering great scope for miming. What should have been a touching and heartfelt rendition of this beautiful song was converted into something else, contorted into an almost unrecognizable version of the original. The singer's exaggerated emoting led him to an elongated wailing and whining which bordered on the comical. Such hyperbolic singing tends to disturb both the audience and the performance. The dance itself was good; it certainly had all the basics on which an outstanding performance could have been built. Where the singer needlessly over-emoted, the dancer seemed to do the opposite. The tender story of the adorable child Krishna always offers a good opportunity for an emotion-packed miming. Urmila Sahoo's presentation was, however, inexplicably mechanical, especially in the sequences showing the churning of butter, the child Krishna gleefully swallowing large quantities of butter, Yashoda taking her child onto her lap and patting him with a mother's tender affection - such sequences could have been more adequately portrayed. These could have been further enriched if the dancer had brought more emotion into play, perhaps if the dancer could have given a free rein to her very own maternal instincts of affection and tenderness. The choreography was by Guru Sudhakar Sahoo and the music set by Subas Ram. The sixth was a duet by Dipti Mishra and Itishri Mohanty who presented two well known episodes from Gita Govinda - 'Yahi Madhava yahi Keshava' and 'Priye charu sheeley.' In a duet, timing is everything, and in the intense verbal exchange between Radha and Krishna, the responses by Itishri playing the role of Krishna were frequently late. This lack of timing reduced the rich dramatic element in the anguish laden sequences, especially in 'Yahi Madhava yahi Keshava' song. A more in-depth understanding of the text was needed and perhaps more diligent inputs from both choreographer and dancers. The essence and the mood of the words of the two songs were at a variance with the dancers' gestures; for instance, the action of Radha flinging away Krishna's hand was done with a much greater degree of violence than befitting the character of an anguished and sorrowful Radha in the persona of the 'uttama nayika.' In the sequence described in the line 'badasi yadi kinchidapi,' the overwhelming emotion shown by Krishna should have been one of helpless anguish and guilt at having caused so much grief to Radha. But Itishri had stitched a smile on her face which totally contradicted the emotion that the abhinaya needed here. Both the dancers have inherently good dancing skills. Had there been a greater understanding of the text and a more careful portrayal of an emotion-packed Gita Govinda, the dancers could have done more justice to themselves and the subject of the dance. The two pieces were choreographed by Guru Sudhakar Sahoo. The seventh and the closing item of the festival was a group dance presented by Kalabikash Kendra, Chhatrapur where Guru Sudhakar Sahoo has spent a lot of time teaching Odissi. Due to the needless and excessive oratory at the beginning of the evening, it was very late by the time they danced, and the audience had been reduced to just a few of us. This delay was singularly unfortunate since the performance turned out to be a good and pleasing finale to the festival. Surprisingly there was a lot of energy in the dancing, everyone in the group full of enthusiasm and very obviously enjoying the performance. The item performed 'Shivastaka' is by no means an easy one, but the sense of involvement the group showed, helped them to soar above a few minor deficiencies. Hailing from the small town of Chhatrapur where the opportunities would be meager compared to Bhubaneswar and Cuttack, the spirit of these young dancers easily overcame this disadvantage. Congratulations are in order and one looks forward to more performances of the quality and the verve shown by the members of Kalabikash Kendra, Chhatrapur. A word about the rhythm accompaniment. The Mardala player who provided the accompaniment throughout the evening's performances is a senior and experienced musician. On a number of occasions, his own need to display his proficiency made difficulties for the dancers, specially in the transition space between one bol and the next: the tihais were muddled and the amplification system betrayed the absence of the clarity in the finger work. 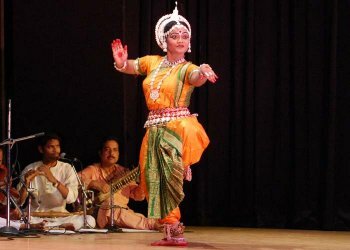 The best of dancers would have difficulties in following the Odissi rhythm patterns if the playing of individual syllables is not clean and distinct. On occasion, what should have been a staccato ultimately became a whirring sound in the double speed. Every good Mardalika needs to guard against this. In this instance, the dancer, instead of being supported by the beat was actually rather destabilized by it. I, myself, am a Mardala player and dancer, and I strongly feel that in a dance performance, the Mardala should play a helpful, supportive role and it is necessary for us to curb all tendencies that seek to convert the Mardala into a strident and overpowering solo instrument glorifying in its own individual and singular existence at the cost of the classical Odissi ensemble. The Mardala is an all important part of the ancient Odissi heritage. In the last several years, concerted efforts have been made to promote it as a solo instrument. Such efforts, though laudable, must not lose sight of the need to create a bank of Mardalikas with the primary ability to play cleanly and distinctly, and provide a full and generous support as the main accompaniment in an Odissi dance recital. The attunement of the rhythm player to a performance in any style of classical dance is critical to the success of the recital.